Whether it is a whole new house, small addition, or a new commercial building or renovation, Atlantic Drywall can meet your needs. Our experienced team can help you decide the right solution for your situation and then, using the highest quality products, produce beautiful walls and ceilings that you'll enjoy for years to come. We have a sizable full-time staff with years of experience that can work with you and your contractor to get your walls and ceilings in place on time, on budget, with quality workmanship. We have years of experience meeting the needs of commercial clients. Whether you need Level-5 walls and ceilings for your professional office space, special mold and mildew-resistant walls for rest rooms, kitchens, etc., we can work with you and your contractor to come up with the perfect solution for your situation. Whether you have a big or small project, Atlantic Drywall will get your job done using quality products installed by our experienced team. Tuff Hide: Tuff Hide is a United States Gypsum product capable of priming, surfacing, level-5 finishes, and finished ceilings. Atlantic Drywall is one of the few drywall companies in the area to offer this product and you will have trouble finding a product superior to it as it leaves a very high-end finish. With two coats of this primer and a quick sanding it also offers an affordable level-5 finish. Sherwin Williams and Benjamin Moore products. 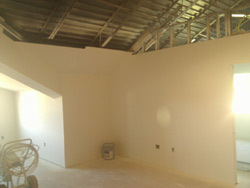 Atlantic Drywall also has vast experience spraying both Sherwin Williams and Benjamin Moore primer and paints. Both companies have products that offer a wide variety of different finishes; from environmentally friendly (which we always use) to the cost effective products. Mythic Paints: Atlantic Drywall also has experience spraying Mythic Paint which is considered one of the most environmentally friendly paints on the earth. It is non-toxing (as all primers and paints we use are), has an ultra low odor, and provides durability and coverage you expect from a premium pant without the off-gassing VOC's and cancer-causing toxins. Interested in using a primer or paint not seen above? We can accommodate your needs as we are experienced with most of the priming and painting products currently seen on the market. Please contact us with more questions. Atlantic Drywall also prefers to Finish Paint your ceilings. It's an easy, quick, and affordable process which most of our customers prefer. Many customers building their own houses or additions choose to save money by painting their own walls but find it difficult painting ceilings. Let us do the hard work at an affordable price and you can save money doing the easy work. We also offer complete finish painting, please contact us for more information.